Insert obligatory shot of a NAMM Show hall here. NAMM 2014: The Winter NAMM Show is famous for its surprises, whether they be groundbreaking new products or unexpected appearances by major artists. But some things, we've discovered, never change. There are certain rituals that we go through every year, and sights that we always see. 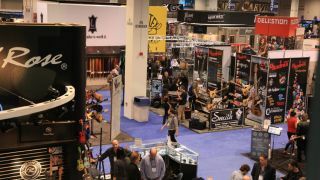 Here, then are our top NAMM show clichés. Write them down on a bingo card and tick 'em off. You're read the teaser stories and watched the pre-show videos. You've followed the forum threads and searched for leaks. But the world-first, show-stealing, groundbreaking, game-changing product that you've been promised still hasn't come to light. And then it's here - the first day of the NAMM show and the big reveal. Is it an auto-assembling drumkit? A mind-controlled synthesizer, perhaps? Nope - it's a slightly tweaked re-issue of a product that was originally released 30 years ago. Are you witnessing the launch of a guitar designed for fey indie types, or a synth that'll be tucked away in the studios of sociopathic producers? It doesn't matter: what you really want to see is a bloke from an '80s hair metal band or a prog keyboard 'legend' shredding away for all they're worth. Don't pretend you're not impressed. You approach a company's booth, only to realise that the products on it were either all released last year or so tedious that people are actually quickening their step to get past them that bit faster. But wait - there's a girl there, and she's handing out free stuff. You like her. She likes you. You think you two have a real connection. Does she want to be your girlfriend? No, she doesn't. You're walking the NAMM aisles and something catches your eye. It looks interesting. It looks different. So you stop and ask to speak to someone to find out more. And then, the slow realisation. This product is a prototype that's in "the early stages of development", and there's still "a lot of work to do". There's no price point, and there's no release date. You look into the company rep's sad eyes and they tell you the truth. This thing is never going to happen. So, you've seen everything that a company has to offer and you're about to leave their booth. But wait a second: there's something else. Allow us to take you behind the curtain. This is a product so secret that it can't be put on show. You'll have to sign an NDA if you want to see it and, even then, you can only see half of it. You can't talk about it, and you can't tell anyone about it. Hell, you can't even think about it. OK, you're no longer in the prime of life and you haven't been to your gym for so long that the next time you visit you'll have to put its postcode into Google Maps, but you're still a world away from extra large clothing. It doesn't matter. When the time comes to pick up your free t-shirt, it's going to be the size of a circus tent and only half as fashionable. You're a company with a big product to launch, and you've decided that the best way to do it is to drip feed information about it in the days and weeks leading up to the NAMM Show. But you've reckoned without the bloke who posts a PDF of a leaked advert on a forum, or the cyberchild who hacks into your server and finds a load of copy and images. So what do you do? Change your plans and reveal the product early? Nope, you pretend the internet doesn't exist, press on regardless and expect people to feign surprise when you do finally make your 'announcement'. It's day three of the show, and you've rocked up to a stand to catch a demo of the new wonder-instrument that everyone's been talking about. Remarkably, you're there on time, but where's the guy who's supposed to be showing this thing off? "He'll just be a few minutes," one of his colleagues tells you, as frantic phone calls are made to try and establish his exact location. And then he shambles in - a man (at least you think it's a man) who's had half an hour's sleep and is sweating alcohol. He phones in his presentation, before his colleague takes pity on him and steps in to answer your questions. Worried that your new product will get drowned out by the NAMM noise? Not convinced that it quite has the wow factor? What you need is a celebrity endorsee, preferably someone who will talk earnestly about being involved at "every stage of the project" (heaven forbid that anyone would put their name to something just for some cold, hard cash) and this being the "best [insert name of instrument here] they've ever played". Does it matter that the same person was endorsing a very similar product from a different company last year? Not really. NAMM can be tiring. There are long halls to walk, and late nights spent drinking hunched over your laptop as you hurry to file your latest scoop. What you really need, then, is a healthy, nutritional diet that'll keep your energy levels up and your blood pressure down. So what do you eat? Deep-fried balls of dough filled with cream and topped with every kind of sugary glazing known to man. They're everywhere, and resistance is futile.